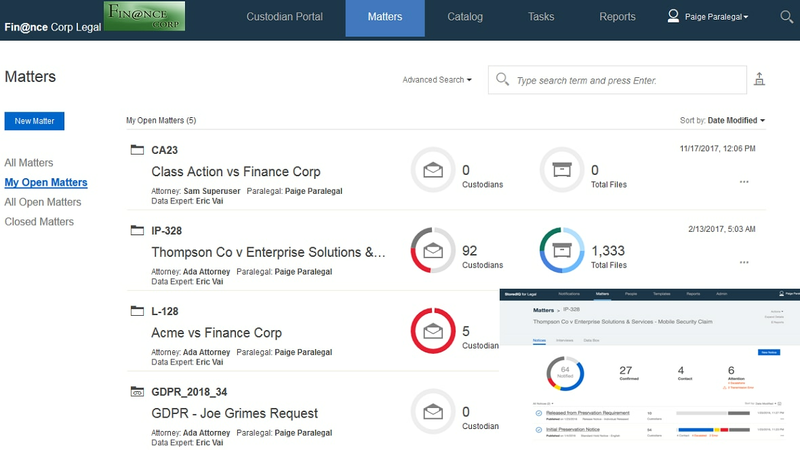 IBM StoredIQ® for Legal provides robust eDiscovery process management from hold notification to identification, preservation and collection. Legal teams can use one interface to manage all data preservation and collection requirements. The solution incorporates automation, analysis and insight throughout the process to help increase efficiency while reducing the complexity, cost and risk associated with eDiscovery events. Maintain an accurate inventory of legal obligations by case. The process includes individuals involved, information scope and whether the duties have been satisfied fully or partially and how. Send hold notices, track responses and automate follow-up and escalations to drive compliance. Pre-interview custodians electronically to reduce the scope of data collected and reviewed. Align legal and IT on what needs to be preserved or collected, where, and by when. Use customizable forms and fulfillment workflows to facilitate a common and timely view of requirements and status. Analyze data in place and take action with insights before collection. Automate legal collections from more than 75 data sources.